Bytecoin is an untraceable cryptocurrency that uses CryptoNote ring signatures to provide anonymous transactions. As a primarily peer-to-peer (p2p) payment system, Bytecoin has many of the same use-cases as Bitcoin. While it's a similar functioning coin, the Bytecoin team is working to improve on many of the issues that have surfaced within Bitcoin – specifically the one’s surrounding privacy. Beyond that, the team is hoping to make the coin more scalable and flexible to the ever-changing financial atmosphere. You can exchange Bitcoin for BCN on HitBTC and Poloniex. Created in 2012, Bytecoin is one of the earliest developed cryptocurrencies. Until recently, the team behind the coin has kept themselves anonymous. Now, though, they’ve opened up multiple communication channels, removed some layers of anonymity, and even built several local communities. The coin has a deep history with Monero, another popular privacy coin and fork of Bytecoin. With a similar functioning coin, the Bytecoin team is working to improve on many of the issues that have surfaced within Bitcoin – specifically the one’s surrounding privacy. Beyond that, the team is hoping to make the coin more scalable and flexible to the ever-changing financial atmosphere. Bitcoin transactions are on a public ledger giving you the ability to easily track transfers between wallets. The only way to keep your transaction anonymous is by using a trusted third-party tumbler to mix transactions. Although there are plans to improve Bitcoin’s privacy functionality, they seem to still be a ways away. Bytecoin in based on CryptoNote to keep your transactions untraceable and unlinkable. Each transaction uses a one-time public key even if there are multiple transactions with the same recipient. Inherently, this eliminates the problem of address re-use and decreases the traceability of transactions. To eliminate the linkability between transactions and transaction participants, Bytecoin utilizes one-time ring signatures. In a ring signature, your signature to send funds mixes with other possible accounts on the network. You’re in control of your ring signature’s level of anonymity. As you include more inputs, your transaction becomes more obscure, but you also have to pay higher transaction fees. Bitcoin’s PoW consensus algorithm heavily favors miners that use powerful GPU and ASIC machines over those trying to mine with CPUs. This causes the network to centralize around the more powerful miners. Bytecoin attempts to close the gap between these two classes of miners with a new algorithm, Egalitarian Proof-of-Work (PoW). Egalitarian PoW uses a version of skrypt, a proof of work function similar to the hashcash function used by Bitcoin. The difference between the two is that skrypt isn’t memory bound. Because of this, you can cheaply produce highly efficient CPU mining rigs. GPUs will always be about 10 times more effective, though. The skrypt function helps to balance the power dynamic because expensive GPUs can only be linearly better than their CPU counterparts – not exponentially as they previously have been. Bitcoin’s mining rewards are halved about every 4 years. In the past, this has caused a sharp decline in the network hashrate immediately after it occurred. With a lower hashrate, the network is more susceptible to malicious activity like double-spending attacks. Bytecoin decreases the block reward with each block. This allows for a smoother decrease in block rewards than the piecewise function that Bitcoin uses. MSupply is equal to (2^64) – 1 atomic unit, the smallest divisible unit of BCN. A is the number of coins that were previously generated. Unfortunately, because Bytecoin has existed for so long, it may not be as worthwhile to mine as other PoW coins. Over 99% of the coins are already in circulation. Bitcoin has several hard-coded constants in its source code that you can’t easily change. In a constantly changing world where it’s nearly impossible to predict the future needs of the system, this poses a problem. We’ve already seen an example of this in the great block size debate. The mining difficulty changes with each Bytecoin block as the network hashrate increases and decreases. This keeps a constant block rate even when the system traffic spikes or has a sharp drop in the number of miners. Every Bytecoin user is able to vote for the size of the blockchain, and each miner sets his/her own soft-limit for the size of the blocks that they mine. The hard limit of block sizes is set at twice the median of all previous blocks. These limits leave room for the blocks to grow, if necessary, as the network grows. Transaction sizes aren’t limited as long as you’re willing to pay the fee associated with them. Where MN is the median block size of the previous blocks. Not the simplest equation, but it does the job. The Bytecoin project has been fairly fractured since its inception in July 2012. Previously, several isolated teams worked on the project without seemingly communicating with each other. This led to numerous forks and versions of the coin. In July 2017, the team decided to change their image and provide more transparency to the community. The team still remains pseudo-anonymous by only providing names and headshots on their webpage – no bios or social media links. But, it’s tough to expect more from a project that’s focused on privacy. UPDATE: The website no longer lists any team members. However, it does include a contact page with several means of communication including the email and name of the community manager. At the beginning of 2018, the team was busy at work refactoring their code and released a new public API in March 2018. Continuing to hit their project milestones, the team also entered the Asian market in Q1 of 2018. It appears as if entrance into the Middle East and African markets have been slightly delayed. The 2018 roadmap coincided with a significant bump in marketing and business development. They’ve accomplished new partnerships with businesses, local communities set-ups, and more active communication channels. At the end of August 2018, the development team performed a hardfork on the network to provide dynamic fees. 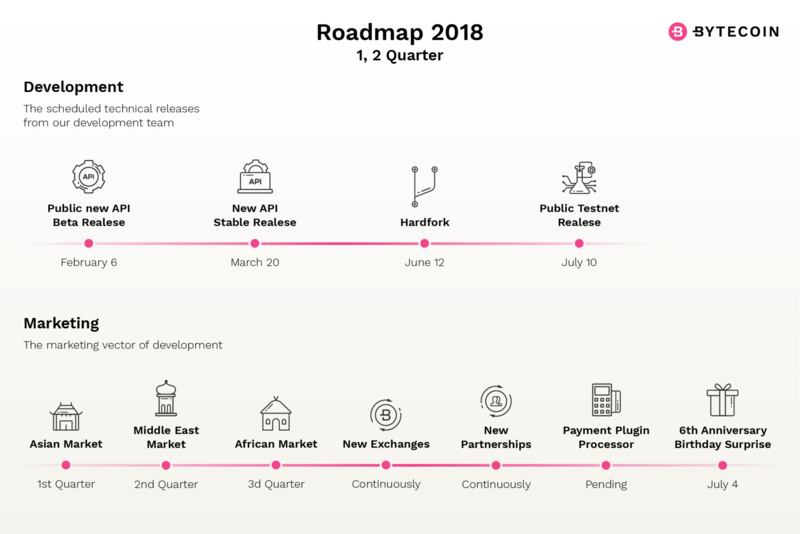 The roadmap for the remainder of 2018 and start of 2019 includes the Amethyst update, which brings HD wallets, unlinkable addresses, and auditable wallets among other features. With a focus on privacy, Bytecoin competes with other privacy coins like Monero, Zcash, and Dash. Monero is actually a fork from the original Bytecoin code. Monero supporters argue that the original Bytecoins (>80%) may have been pre-mined for 2 years before the public release, but this is still being debated by both parties. There’s a little over 184 billion BCN coins in circulation right now. As the mining rewards decrease, there will only ever be a maximum of 184.47 billion BCN in the market. So, as you can probably tell, most of them have already been mined. The BCN price remained relatively stagnant between $0.00002 and $0.00005 until May 2017. At this point, the price skyrocketed to ~$0.0043 and an all-time Bitcoin high of 0.00000198 BTC. This rise in price coincided with an overall market interest in privacy coins as well as an announcement that Bytecoin would be implementing untraceable tokens – something the market had never seen before. After this spike, the price steadily fell with a short-lived rise when the team announced a fresh focus on development transparency and communication. Like most other altcoins, the BCN price had a great bull run in December 2017. Shockingly, the BCN price moved against the falling bear market in May 2018 to reach another high of about $0.0126 (~0.00000146 BTC). The rise in price coincided with a Binance listing and was a source of controversy in the crypto community. Opponents allege that the coin was the center of a pump-and-dump once available on the platform while the team argues that the volatility was due to a network consensus bug. Binance has since delisted BCN. Privacy coins all seem to trend upward in price around the same time. Therefore, it wouldn’t be surprising to see another increase in BCN price coinciding with a price increase of Monero or Zcash. You should note, though, that BCN now sits flat at a price of around $0.000764 (0.0000002 BTC). Even though the roadmap stated that BCN would be available on more exchanges in Q3 2018, you still have relatively few options to purchase some now. You can exchange Bitcoin for BCN on HitBTC and Poloniex. Before trading on those platforms, you’ll first need to buy Bitcoin on another exchange like GDAX. The desktop wallet is available on Mac, Windows, and Linux, and you can access the web wallet from any web browser. Right now, only Android users can use the mobile wallet. The team has not announced a release date for the iOS wallet. When using these wallets, you should also set-up encrypted passwords and two-factor authentication. These additional measures will secure your wallet to a greater extent than the default set-up. Bytecoin is one of the oldest blockchain projects and one of the first to focus on privacy for the end-user. Even with the goal of improving on Bitcoin, the team clearly states in their whitepaper that they don’t consider Bytecoin as a Bitcoin replacement. Instead, they feel that having multiple strong currencies is beneficial to everyone involved. The recent resurgence of team communication and transparency bring trust to a project that has a history considered by some to be questionable. That being said, the project continues to receive criticism from the community for issues like the alleged Binance pump-and-dump. As governments continue to be more involved with the crypto space, the interest in privacy coins will most likely continue to increase. It’s unclear whether Bytecoin will be the privacy coin of choice, though.